Kudos to marketers of junk food. They have created illusions of products that are so alluring that hungry people are twice as likely to be distracted by junk food than natural, healthy food. According to what new research findings suggest, people have been trained to respond more readily to highly processed, chemical-laden ‘faux food’ rather than natural, whole foods. Luckily, the researchers also found that after only a few bites, junk food was no more enticing or distracting to people than whole, natural foods. This leaves hope for people to retrain their brain’s reactions to the manipulative marketing and packaging of junk food when they need to nourish their bodies and brains. A key factor in this process: Don’t keep junk food in the house. And, if another household member insists on keeping junk food on hand, at the very least, tuck it away in the pantry, out of sight. Researchers Dr. Howard Egeth, a professor in the Department of Psychological and Brain Sciences and lead author Dr. Corbin A. Cunningham, Distinguished Science of Learning Fellow in the Department of Psychological and Brain Sciences, created a complicated computer task, in which food was irrelevant, and asked a group of participants to find the answers as quickly as possible. As the participants worked diligently, pictures flashed in the periphery of the screen — visible for only 125 milliseconds, which is too quick for people to fully realize what they just saw. The pictures were a mix of images of high-fat, high-calorie foods, healthy foods, or items that weren’t food. 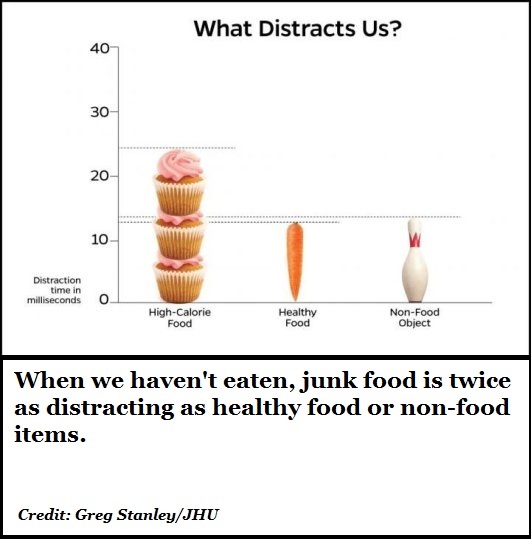 Cunningham said the results strikingly demonstrate that even when food is entirely irrelevant, and even when people think they’re working hard and concentrating, [junk] food has the power to sneak in and grab our attention — at least until we eat a little of it.